For over 35 years The Refinishing Touch has worked with hotel managers and owners to deliver on-site furniture refinishing and re-upholstery services. From this extensive experience we really understand the challenges, pressures and restrictions hoteliers face during day-to-day operations, especially during renovations. During hotel renovations, the managerial team must remain aware of budget limitations while simultaneously adhering to brand standards. Hoteliers must also make the important decision to either shut down, close areas of the hotel, or remain fully open for business during restoration, a factor that affects market competitiveness and guest satisfaction. With these obstacles in mind, we ran a new blog poll to gather feedback from readers of our blog and to uncover insights useful to hoteliers facing the challenge of renovations. At The Refinishing Touch, we’re proud of our on-site, sustainable and cost efficient furniture asset management services. Our work is quick and seamless – we complete up to 20 guest rooms each day, and work with our clients’ agendas to help hoteliers remain open for business during renovations. For more information on our award-winning furniture refinishing and re-upholstery solutions, please request a free quote here. We look forward to hearing from you soon! As we reach the final hurrah of the summer, Labor Day, we are drawn toward the thought of another school year and how parents, students and faculty alike, are all striving to establish sustainable solutions that save money and help the environment. Carpooling: If you’re driving kids to elementary school, or commuting to undergraduate college classes, consider setting up a carpooling group. In a recent article, we learned that families spend an average $150 on gas and driving costs per month. By carpooling, those costs could be reduced significantly depending on how large your group, and carbon emissions could be reduced by minimizing the number of cars on the road. Recycle: Many school functions revolve around paper products, from composition books to textbooks, and students are hard-pressed to find a day that doesn’t require the use of paper. This school year, be conscious about conserving all types of paper products – whether that means you commit to a paperless study habit or set a cap on how much you print per week. This also includes recycling; instead of throwing away paper, make the point to recycle it. If your school doesn’t have a recycling program, drive the initiative and get one started. Reuse: While not all school products are reusable, get creative about the ones that are. Have a half-used notebook from last semester? Continue using the remaining pages until it’s full. Not sure where all your pens went? Go through book bags and desks before buying new ones. And reuse doesn’t stop at traditional school supplies – encourage your school to reuse and refurbish non-traditional items as well, including desks, chairs, podiums and more. Often times furniture refinishing or an updated color changes will bring these pieces back to like-new condition. Have additional ideas as to how schools, students and families can become more sustainable this year? Submit a comment on the blog or send us a tweet at @RefinishTouch. As always, we would love to hear from you. And from the entire team at The Refinishing Touch, we hope you have a safe and happy Labor Day! As the sustainability movement continues to strength across the hospitality, government and higher education industries, many are now focused on how to successfully mix both environmentally-consciousness and aesthetics. Recently, particularly at hotels where style is key, the concept of ‘eco-chic’ is traditionally a trend that is shied away from, assuming there’s a large price tag that accompanies such a name. But here at The Refinishing Touch, our goal is to provide tailored furniture asset management services to help hotel operators realize that not only is ‘eco-chic’ attainable, but it is also affordable. 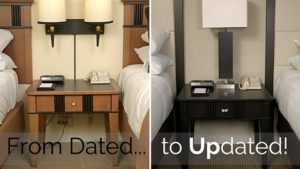 According to a recent article in Hotel Interactive, hotel chains that utilized some of these renovation alternatives spent $15,000 to $20,000 per room in costs, but in return, boosted rates from $75 per room to $225 room. As it turns out, hotels can please guests and Mother Nature at the same time, all while capitalizing on profit. As providers of on-site sustainable furniture asset management services, we continue to make the goal of becoming ‘eco-chic’ more achievable than ever, benefitting both the guests and the hotel owners. For more information on The Refinishing Touch’s services or to get a free quote, go to www.therefinishingtouch.com. Thirty-five years, 420 months, roughly 12,775 days and countless hours—anyway we chalk it up, we here at The Refinishing Touch are thrilled to announce our most recent milestone of three and half decades in business. While many things have changed throughout the years, the purpose throughout our journey has remained the same. Everyone at The Refinishing Touch believes in our goal to create a more sustainable future, which, as we’ve come to learn, is a task that takes time, effort, and support from others. But through this unwavering goal and 35 years of hard work, we could not be more proud of the on-site environmentally safe and sustainable furniture asset management services we offer to a wide array of companies and organizations around the world. Not only are we excited over reaching the 35-year mark, but we are also humbled by the opportunities we’ve been given to serve the hospitality, education, and government industries throughout the years. Every partnership The Refinishing Touch creates contributes to a smaller carbon footprint and a more informed country. We’d like to take a moment to thank our clients for helping us reach such a milestone. In the hospitality industry, this includes hotel chains such as the Hilton, Hyatt, Marriott, IGH, Wyndham, and more. The government has also capitalized in furniture asset management services, with projects completed in the U.S. Superior Court, U.S. Army, Air Force, Marine Corps and Navy bases worldwide, including the White House and Executive Office of the President. In the education sector, we have worked with numerous universities and colleges across the nation. Today, The Refinishing Touch has more than 20,000 customers and we estimate that we have saved more than three million tons of carbon dioxide and nine million trees. For us, that is what it all comes down to as we reach 35 years in the business – a more sustainable tomorrow. Click here to read the entire press release on The Refinishing Touch’s 35 year anniversary milestone. As a leading furniture restoration and armoire modification company in the hospitality, government and higher education industries, it’s great to see organizations thinking outside the box to increase sustainable and environmentally-friendly initiatives. And Gaylord Hotels is the most recent hospitality establishment to have done just that, by committing to recycling soap and bottled amenities at all four of its North American locations. Clean the World, a charitable organization dedicated to global hygiene education, will in turn recycle the unused or lightly used toiletries (soap, shampoos, conditioners, body washes, lotions, and gels) and distribute them to shelters, rescue missions, and organizations worldwide. Clean the World estimates that more than 84,000 pounds of soap and 62,500 pounds of bottled amenities will be collected from Gaylord to aid underprivileged children and families throughout the world. Gaylord joins an entire network of organizations that have answered Clean the World’s call. In its three years of operation, 1,400 contributors have amassed over 10 million bars of soap and other hygiene-related items to give to disadvantaged communities in 45 countries. With 9,000 children worldwide dying each day from respiratory infections and diarrheal diseases—which can be prevented by washing with bar soap—Gaylord and Clean the World have made a venerable commitment to spread outreach to the farthest corners of the world. Gaylord’s contributions serve as a reminder about the importance of being an informed hotel guest and to support hotels who have undertaken sustainable, green initiatives. Whether it’s reaching out to Clean the World, refinishing furniture rather than buying new, or sourcing locally grown food for hotel restaurants, these establishments deserve our support in keeping our environment clean and our fellow humans healthy and safe. Renewable energy can, at times, be a difficult concept for individuals, companies, and local governments to grasp. Recently, we read an article that discussed how Virginians are mistakenly sticking to traditional electricity instead of embracing reusable energy because of its convenience and cost. The article also highlighted some unknown facts about renewable energy and how legislation is encouraging increased use. And while the article focuses on energy specifics in Virginia, many of the points are pertinent to everyone, nationwide. Renewable energy can be derived from more forms than many are aware of, including wind, falling water, wave motion, waste, biomass, and tides. Though offshore wind is the most expensive of these resources, states are beginning to fund projects directed at finding innovative ways to reduce the cost of offshore wind development. Massachusetts has developed Cape Wind, America’s first offshore wind farm, which is estimated to produce up to 420 megawatts of clean energy, while some electric companies, such as Virginia’s Dominion, have received grants to develop similar programs. Many states have created benchmarks for energy companies when it comes to electricity and reusable energy. Some, such as New Jersey and Maryland, have made it mandatory for electricity providers to generate a percentage of energy through renewable resources. Other states, including Virginia, have enacted soft standards, recommending percentages (15% by 2025), only giving bonuses if the goal is reached, but no penalties if it is not. As a furniture refinishing and reupholstering company, we understand the importance of sustainability and reusing our environmental resources. Because of this, we hope that states will continue to take action, whether through reusable energy mandates, or overarching legislature. Encouraging homeowners, companies, and the government to join together to go beyond the convenience of traditional resources is the only way to develop the discussion and further the fight for widely accepted renewable energy use.